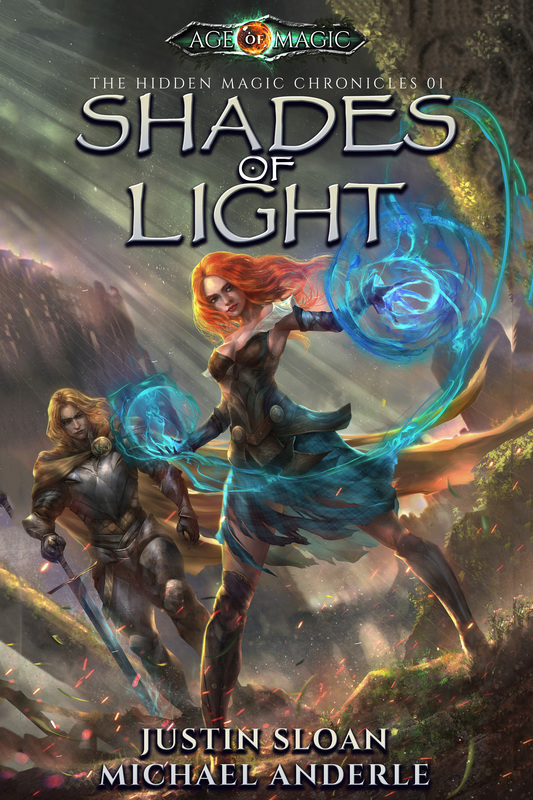 In case you didn’t hear yet, SHADES OF LIGHT is now live! 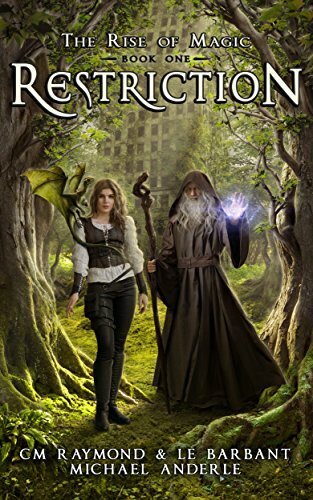 My latest fantasy book release is on Amazon for only $2.99, and is #1 in Medieval Fantasy and Arthurian Fantasy (600 overall Amazon!). Michael and I wrote this together as part of the new KGU spinoff, AGE OF MAGIC, which CM Raymond and Le Barbant started. Mine is a spinoff that takes place in what used to be Scotland, and follows a brother and sister as they battle with the concept of magic and who to trust. It’s been a lot of fun, and watching the reviews come in has been quite fun (except one, some person who seems totally lost as the review has nothing to do with the book). So… I decided to set up a fun game around the new release. Below you can grab a free short ebook, enter Amazon giveaways, and help spread the word — all free — to enter to win an Shades of Light ebook and $25 Amazon gift card! Just because I love you all and appreciate your help in spreading the word. CONGRATS TO BLYTHE J! You won 🙂 I’ll email you about your prize. Thank you to all who played! 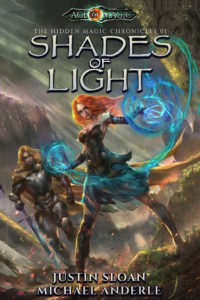 Win Shades of Light and a $25 Amazon Gift Card! Rhona and her paladin brother Alastar belong to a holy people who have waged war on witches and warlocks and their clans from the highlands. But when she uses magic to save his life, their world is thrown upside down. On the run, having left all they knew behind they have to rely on those who hate Paladins. All magic is evil, the High Paladin taught… But Alastar starts to understand that he might have been mislead. If his sister uses magic, and she isn’t evil…what does that mean for his beliefs? Brother and sister soon find themselves aligned with magic users and thrown in with the clans in a war against sorcerers and paladins alike, with only one hope of uniting the land–the legendary Sword of Light. It was lost years ago, and quest after quest by the holy paladins could not retrieve it. When you know the truth about magic… anything is possible. Way, and I mean, way in the future, humanity; hearing only legends of the past….discover powers. Without technological knowledge, it appears to be magic. This story just proves that there are always unique approaches storytelling, and a great story it is. If you haven’t yet read The Kutherine Gambit, that’s okay because this take stands alone ( for now). Those of us that have been here through it all can see the connections, but you don’t have to, although, I highly advise going back and starting from the beginning……It’s a highly addictive series with a unique take on..oh…just about everything and on top of that about the best group of funny, clever, geeky ( in a good way), smart assed, quirky and friendly authors I have ever had the pleasure of reading and interacting with. I am not exaggerating when I say, if you join this family you will never look at books the same. Make no mistake, Michael Anderle and All the authors in This Universe, are changing the dynamic from writers and readers to a interactive, living creation of creative and curious humans coming together in peace, mutual respect and friendship in an experience never seen before . You can literally feel it. fantastic!! Story is set many many many years in the future in a world that no longer has technology. Where loyalties come up against long held beliefs. Wonderfully written with good character developement. A wonderful addition to the Kurtherian Universe. Well done Mr. Sloan. I loved the development of the characters & the differences in how these people manifest their magic. It looks like a series to watch & read of course. So yes, my new fantasy book release has gone well, and more in the series will be following shortly! Spread the word, and don’t forget to check out the RISE OF MAGIC books, by CM Raymond and Le Barbant. I’m looking forward to reading this one. It sounds awesome and the cover looks amazing! Congratulations on your new book! It sounds fantastic!